BSNL Mobile has announced the launched new ‘Yuva Gujarat Prepaid plan’ in addition to new Student Special Prepaid plan under GSM Mobile services. State run Telecom Company Bharat Sanchar Nigam Limietd (BSNL) to more young subscribers to its network launched new Prepaid plan ‘Yuva Gujarat’ of Rs.149/- offers Free data usage as well Free Talk Value with Per second pulse rate across Gujarat Telecom Circle as promotional basis for a period of 90 days from 18th June, 2016 onwards. BSNL according to the 43rd Amendment of TRAI (Telecom Regulatory Authority of India) instructions/guidelines/orders from time to time has introduced new Prepaid plans i.e Student Special and Yuva Gujarat for young BSNL Prepaid customers in Gujarat Telecom Circle as Promotional offer basis. 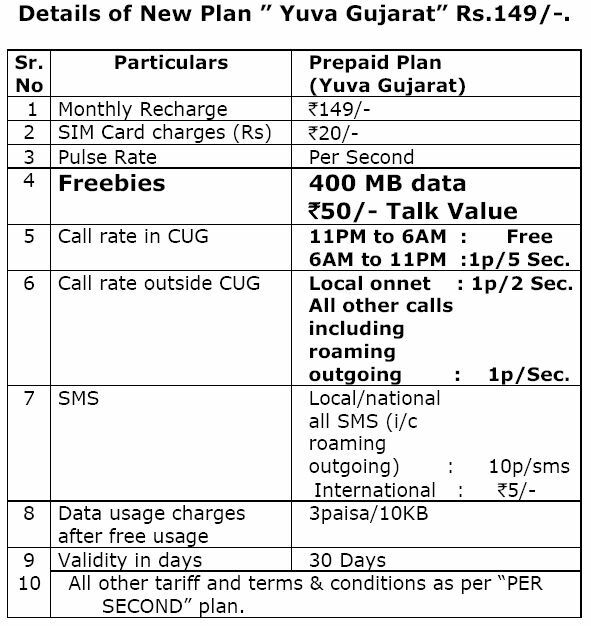 As per latest information, BSNL Gujarat Telecom competent authority has decided to introduce a new ‘Yuva Gujarat Prepaid plan’ which is offering Rs.50/- Free talk value and 400MB Free data usage under per-second pulse rate for existing/MNP (Mobile Number Portability) Prepaid users. Under this plan the call rates within CUG from 11pm to 06:00am are Free of cost while from 06:00 am to 11:00pm call charges will be 1 paisa per 5 seconds. Whereas, for out side CUG all Local voice call (On-net) @ 1 paisa per 2 seconds and all other calls including roaming outgoing calls @ 1 paisa / second. For all SMS to Local/National (incoming roaming/outgoing) is @10 paisa per SMS and for international @ Rs.5/- per SMS. The data charges after free usage i.e beyond free data usage @3 paisa per 10KB. Yuva Gujarat Prepaid plan comes with Plan voucher of Rs.149/- (Rs.20/- additional for SIM cost) monthly plan) with validity for 30 days. BSNL has provisioned a facility where existing prepaid users can migrate to ‘Yuva Gujarat Prepaid plan’ using Plan voucher of Rs.149/-. The above Prepaid plan will be implemented with effect from 18th June, 2016 and available upto 15th September, 2016 for a period of 90 days as promotional basis across Gujarat Telecom Circle.